Hypertension is potentially damaging to the eyes, brain, heart, kidneys and central nervous system. It may be idiopathic or secondary; so it often occurs in association with another underlying disease. For example, cats suffering from kidney disease or hyperthyroidism often have some degree of hypertension as well. By finding hypertension early we can avoid sudden issues such as retinal detachment, blindness and seizures. 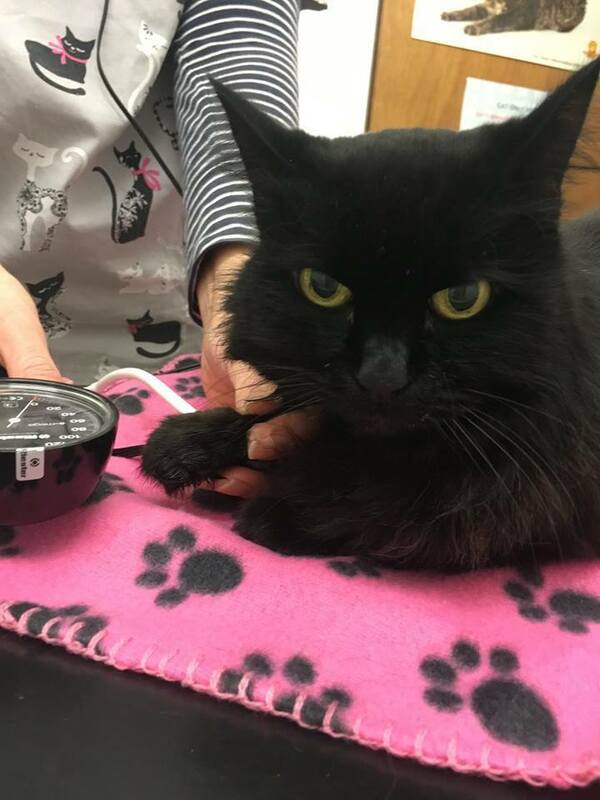 Hypertension is normally recognised in cats over 10 years of age, but we recommend assessing the blood pressure from the age of 8 so that mature to geriatric cats will benefit the most. In many cats, no specific clinical signs of hypertension will be seen until the condition advances to the point where there is spontaneous bleeding into the eye or retinal detachment. Some cats will appear depressed, lethargic and withdrawn, and many owners notice an improvement in their cat’s behaviour once hypertension has been successfully managed. The earlier it is treated, the sooner the cat will feel brighter and more alert. We recommend a blood pressure test to all cats over 8 years old once a year, but more often if your cat has signs of hypertension. Cats often do not show signs of hypertension so it is important to regularly check this and by checking it yearly (or more often) we can compare the readings and get a more accurate assessment for each individual cat. An annual blood pressure check is part of our senior pet health plan and is included in your monthly cost. You can find out more about our range of pet health plans here.